A fragrance so unique it’s only meant for one as unique as you. The top notes of tangerine, red fruits and spices leave a bold impression at first meeting. The middle notes of gardenia, jasmine and ylang ylang are a symphony of wild flowers blooming forth on the first day of spring. The base notes of sandalwood, balsam and musk make a statement to be remembered. 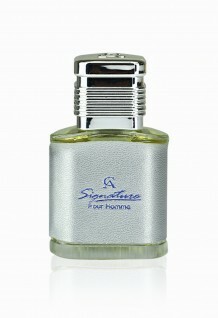 The fragrance comes held in a granite grey bottle, a heard exterior for a fragrance that makes a solid impression. The fragrance is then placed in a box of pure white and purple, a combination of colours as stunning as the fragrance itself. Chris Adams, crafted in Paris, is a group whose hallmark has been and continues to be the relentless creation of contemporary designs and fragrances. Our dedication in developing highly creative products of superior quality gives us a winning edge and plays a key role in driving us towards our vision and goals. Our designs, elaborated in the pure tradition of French perfumery, have gained immense success all over the world seen by our presence on all five continents. Our teams associate their knowhow to their ability to understand the needs of a market in perpetual evolution, in order to propose to our customers the latest concepts of long lasting and luxury perfumes in sophisticated packaging. To satisfy the needs and expectations of a more various and demanding clientele, we have developed a vast range of products to which we add every year about a dozen novelties. We aim to commit ourselves in achieving an irreproachable service and quality. For that we bring a particular attention to the choice of our partners. Our designs are a work of renowned French and European designers, our bottles are manufactured by glass makers of big fame and our scents, which is the heart and soul of our products, are created by some of the most prestigious and renowned French/European perfumers under the meticulous attention of our Master Perfumer. Yet for all this they are sold at “value for money” prices for people from all walks of life.